Acacias occur naturally mainly in dry tropical or mild temperate regions. Authorities vary on the exact number of species that exist, but more are native to Australia than anywhere else. Other species are as wide spread as Africa, America and South East Asia. Some occur naturally in snow prone areas, and can withstand very harsh winter conditions. Being legumes, Acacias are useful for land rehabilitation, fast growing and able to contribute to improving soil fertility. They include commercially important plants grown for wood, producing gum arabic, and even edible seeds. Learn about the physiology, botany, culture, and propagation of Acacias. Learn about their nutritional and environmental requirements, as well as potential disease and pest issues. Learn about the wide range of commercial uses for Acacias - the food industry, in perfumes, medicine, furniture, as well as being used in land rehabilitation projects. Nature and Scope of Acacias. Plant/Acacia Taxonomy (classification and naming). Significant Acacias from Australia, Africa and the Middle East. Acacia relatives; and the Order Fabales. Understanding flower structure of Acacias. Using Botanical terms to describe Acacias. Classifying Acacias according to foliage type. Classifying Acacias according to flower type. Australian Acacias (review of size, foliage and flowering). As a landscape plant (windbreaks, screens, shrubberies, erosion control, soil enrichment, rock gardens, tubs). Using Acacias as specimen trees. Acacia species for different conditions. Nature and scope of Pest and Disease. Pest and Disease problems detected on Acacias. Problem Based Learning style project, to plan the establishment of a collection of Acacias for a specific location. You may think that acacias are all short lived, super hardy, and come from similar places; but nothing could be further from the truth. Some species are indigenous to very low rainfall areas, others come from high rainfall rain forests. Some are native to cold, snow prone climates, and others occur naturally in hot deserts closer to thew tropics. While some acacias are relatively short lived, there are others that can survive well over 100 years. 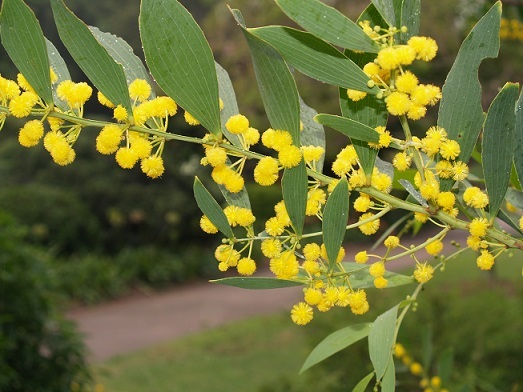 As you progress through this course, you will deepen and broaden your understanding of many different species, learning to choose, nurture and use acacias more appropriately for different purposes in different places. Acacias, like all plants obtain their food in the form of nutrients from the soil. There are around 50 different nutrients used by plants. Some are needed in large quantities (eg. Nitrogen, Potassium and Phosphorus), whilst others are only needed in small amounts. Different species of Acacia have different requirements. Nutrients must be in the right balance in the soil (ie. too much of one nutrient can stop another nutrient being used, even if it is there in an adequate quantity). If iron in the soil is in limited supply; the uptake of that iron can be impaired by high levels of phosphorus; the result being a yellowing of tip growth due to inadequate iron in the plant. The solution might not only to add iron, but also to avoid phosdphorus. The acidity of the soil can affect the plant's ability to use nutrients; thus the acidity (or pH) must be at the right level for the plant to perform at it's best. Each type of plant has a different set of chemical conditions which are ideal for it (ie. what is best for one type of plant may not be best for another).